Find out what you're going to watch on TV tonight in just a few seconds with the 7-Day TV TV Program for Windows Phone. Rich in features, this application provides you with a schedule of programs from more than a hundred different channels over a week. You can also consult the casting of a series, or the guests of a show in preview. In addition, you have access to current programs and the first real-time zapping, better known as zapster. Télé 7 Jours Programme TV for Windows Phone has a simple and neat interface, with channels recognizable by their logo and illustrations of each programme, as well as their summary. This application also includes editorial reviews to give you an opinion on the programmes broadcast. A tool that can help you make a choice when in doubt. 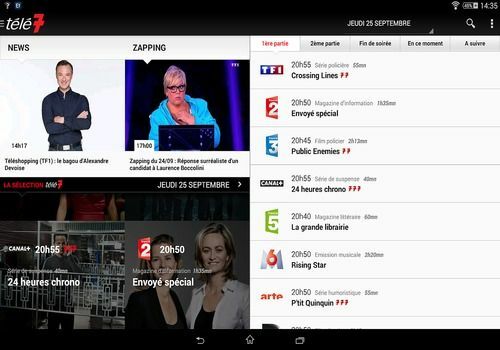 The Télé 7 Jours Programme TV application also exists under Android and iOS. Ludo - Cartoons is the iOS application of the Ludo channel. Thanks to it, children will be able to follow the adventures of their favourite heroes anywhere. Timeto is an entertaining software for your wallpapers. You can share your stories, discover those of your friends, or select your favorite wallpapers that will automatically alternate.